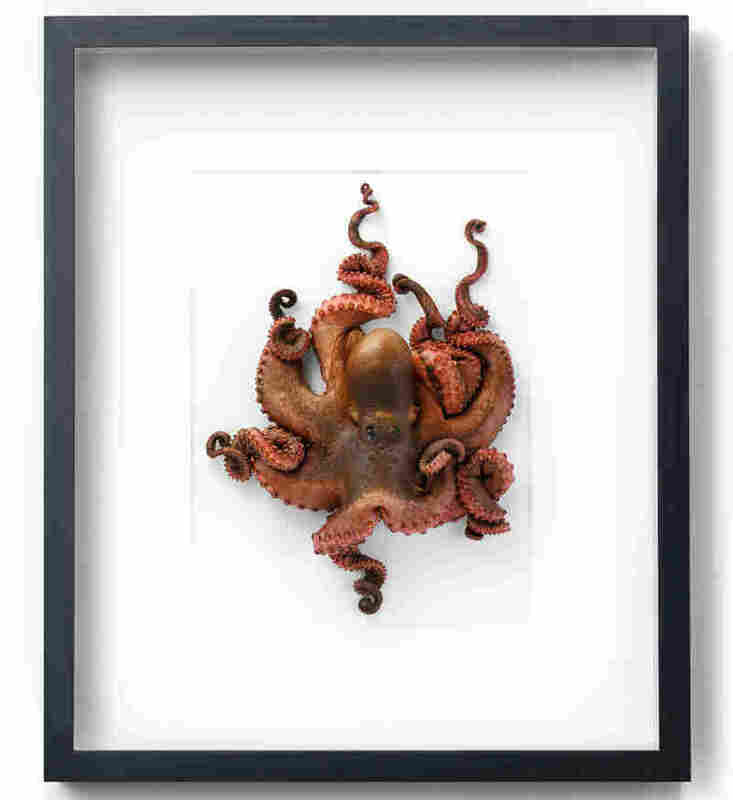 Oregon Artist Turns Dead Creatures Into Beautiful Compositions Christopher Marley only uses specimens that have died from natural causes or been caught as fishing bycatch. Then he freeze-dries them, which is why they seem so alive in his artwork. 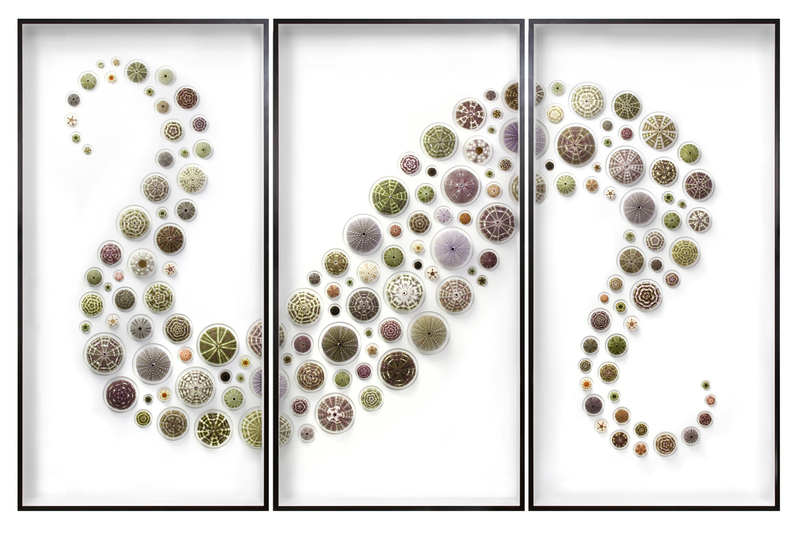 Urchin Triptych is one of hundreds of Christopher Marley artworks on display at the Gallery of Amazing Things' "Biophilia" exhibition. It's just before Thanksgiving, and artist Christopher Marley is packing up items for a big exhibition outside Miami. 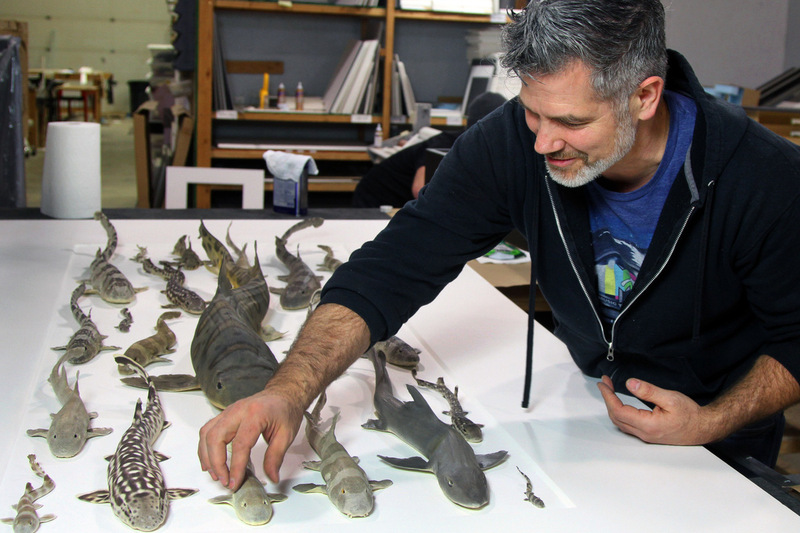 Marley transforms poisonous snakes, tropical fish and exotic insects into works of art — and he just realized he forgot to frame a foot-long isopod that's still in the freezer. 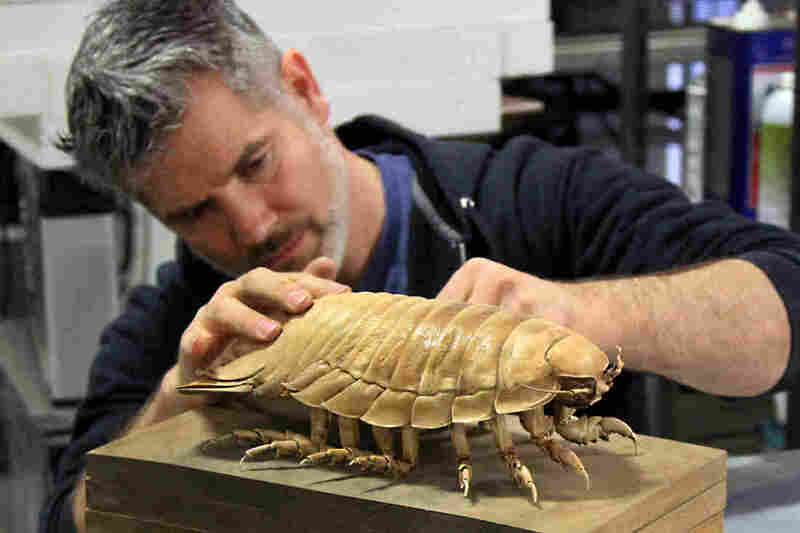 He says the creature is "like a giant pill bug or potato bug or roly-poly" — but those are all understatements. It actually looks right out of Starship Troopers, or some other movie starring monster bugs that eat people. Marley admits they can do some damage. Marley works on a frozen isopod at his Oregon studio. "There have been fish caught that were, you know, living, and they've found giant isopods in their throats or in their guts eating them from the inside out. So they're the stuff of nightmares, that's for sure." But in Marley's hands, they're also beautiful. 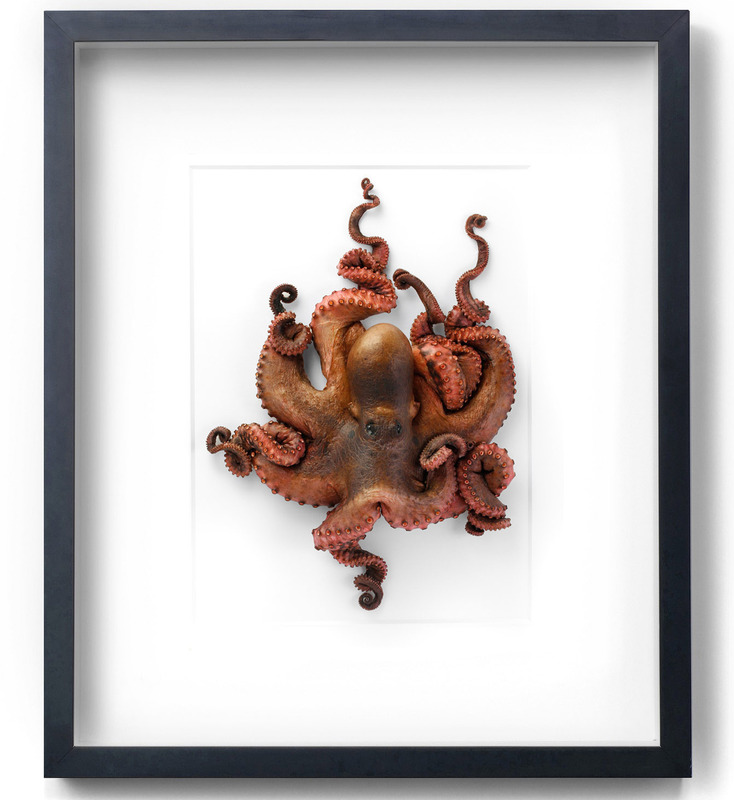 He preserves all sorts of beasts and poses them in frames against white backgrounds. Chromatic beetles cluster like mandalas; snakes coil like intricate pendant necklaces; macaws spread their rainbow wings; and octopuses twist and curl so voluptuously, they seem to be alive. Notre Dame biology professor Kenneth Filchak uses Marley's work to inspire his students. He says Marley "might just be sort of the Michelangelo of this sort of presentation and preservation." Marley arranges reef sharks onto a mat. Marley grew up wanting to be an artist, but he was gifted with a square jaw and biceps like boa constrictors, so he went into modelling. As he hopscotched the globe for photo shoots, he collected insects and arranged them into iridescent kaleidoscopes. His fiancé convinced him to show them to several stores in Los Angeles, and the orders came flying in. So Marley quit modeling and started backtracking through the countries he'd visited sourcing sustainable insect collectors. It just so happens that his dad is a breeder of rare color mutations of Australian parrots. "Throughout my whole life, we'd always had dead birds in our freezers all the time," Marley says. "My dad just could not bear to throw these beautiful birds away. That's when I realized, you know, if my dad does this with birds, I'll bet you that most people that deal with any type of organism that they're in love with — that they probably do the same thing." And they do. Marley built a network of breeders, zoos, aquariums and importers who all send him their dead. He's very clear that he only uses reclaimed specimens that have died from natural causes or been caught as fishing bycatch, and doesn't buy from hunters. The specimens (in various stages of decay) end up crowded in freezers in his Salem, Ore., warehouse. Scientists generally keep such animals in liquid, but Marley has pioneered a way to freeze-dry them, which is why they seem so alive in the frames. He sells his creations in high-end stores and has shown them in natural history and art museums alike. His work has also appeared on the covers of biology textbooks and in Marley's own art books, Biophilia and Pheromone. By isolating these organisms from their natural environments, Marley hopes people will see them anew. "The greatest power of the work itself is helping people to open their eyes to the varieties that exist in the natural world," he says. "Once you get this sense of, 'Oh my gosh, there's so much more I didn't know about,' ... it just feeds this desire to see more and more and more." Tom Cole produced and edited this story for broadcast. Nicole Cohen adapted it for the Web.